"There is nothing easy about the breakup of a marriage, from coping with loss and failure to dealing with the uncertainty of the future. In this intelligent and insightful book, Abigail Trafford charts this emotional journey, identifying the common phases in the evolution from marriage to separation to divorce, and eventually to a new life." "Jim has counseled single-again people for more than 30 years. Drawing on this experience, he offers men and women the practical, step-by-step help they need to survive the turmoil of divorce and come out healthy and secure. practical, insightful, and helpful books available today." "Based on the Children of Divorce Project, a landmark study of sixty families during the first five years after divorce, this enlightening and humane modern classic altered the conventional wisdom on the short- and long-term effects of family dissolution." “His wise guidance shows readers how to: establish realistic expectations about divorce; find and hire a good attorney; control their attorney's actions and fees; use mediation and/or arbitration effectively; handle child and spousal support; protect children during the difficult times." A realistic perspective on divorce and its effects on children, Parenting After Divorce features knowledgeable advice from an expert custody evaluator. 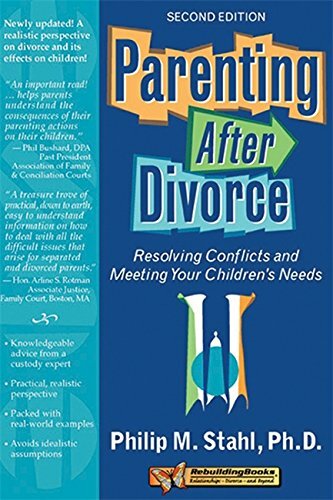 Packed with real-world examples, this book avoids idealistic assumptions, and offers practical help for divorcing parents, custody evaluators, family court counselors, marriage and family therapists and others interested in the best interests of the children. "A guide which advises parents on how to walk away from a marriage with the least effects on the children. New attitudes about children and divorce's effects are needed: Oddenino provides these insights, juxtaposing case history examples of parent interactions and experiences with the legal system with keys to therapies which help heal the entire family." "In this immensely moving book, nineteen boys and girls, from seven to sixteen years old and from highly diverse backgrounds, share with us their deepest feelings about their parents' divorce. By listening to them, all children of divorced parents can find constructive ways to help themselves through this difficult time. And they will learn that their own shock and anger, confusion and pain, have been experienced by others and are normal and appropriate."